The longest winning run at home in NBA history was halted at 54 games as the Golden State Warriors were beaten 109-106 by the Boston Celtics in Oakland. 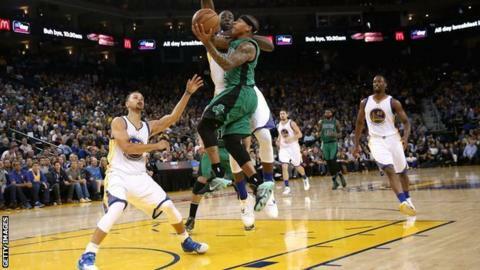 Isaiah Thomas scored 22 points for Boston, including a match-winning driving lay-up with 8.3 seconds left. Stephen Curry missed a long three-pointer to tie the match with 5.3 seconds remaining on Friday. The loss was their first at the Oracle Arena since January 2015 - the streak included 36 straight wins this season. The reigning NBA champions, who have won 68 games and lost eight this season, retain a 4.5-game lead over the San Antonio Spurs in the Western Conference. The Warriors next meet the Portland Trail Blazers at the Oracle Arena on Sunday. Curry, 28, said the defeat left him with "a weird feeling", adding: "We've just got to be able to move on from it. "Maybe it's a good reminder going into the play-offs we don't want this feeling." The Warriors must now win five of their final six games to break the Chicago Bulls' 1995-96 NBA season record of 72 wins home and away.